You saw a room design you loved on Love It or List It. You've combed through Pinterest and come up with a new bedroom design board. (and maybe a living room design board... and a kitchen design board...) You visited a friend's home and came back with an urge to redecorate. Indianapolis flooring store Kermans understands. In fact, you might say we specialize in helping you take that design inspiration and making it a reality - at least when it comes to your flooring. One of our best tips to changing up a room instantly? An area rug. Affordable, versatile and high impact area rugs are a great way to change up the look and feel of a room without spending a lot of money. Area rugs come in a wide variety of shapes, sizes, patterns and colors. They can make a bold statement with bright colors or they can subtly tie a design together with neutral, complimentary shades. When people shop at Indianapolis flooring store Kermans, they are often surprised at the wide selection of area rugs - and the wide range of prices. There truly is an area rug that works in any room of your home. "Grey is the hot color for interior design right now," notes Kermans Design Consultant Nichole Hansen. "I talk to people every week who want to update their design with grey flooring. Area rugs are one of the best ways to do that - especially if you're designing on a budget." Even with that wide variety, what if you can't find just what you're looking for? Move over to the carpet section. Yes, carpet. Kermans is able to take any carpet and cut it into an area rug of any shape or size. "Many people find a patterned carpet or a carpet with two-three tones of grey that they just love and we can take that carpet and create a custom area rug," says Hansen. Patterned carpets and textured carpets are very popular right now but not everyone wants that impact over an entire floor - particularly in a great room or large living area. Using those carpets to create an area rug is the perfect solution. 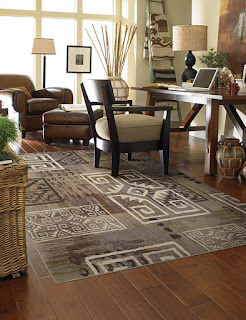 Now is the perfect time to look at area rugs at Indianapolis flooring store Kermans. We're having an area rug clearance sale all month. Stop by and talk to one of our design consultants about your design inspiration and mention that you read this article. Even better, make an appointment ahead of time - it's free - and they'll have area rug suggestions ready for you to review when you arrive.